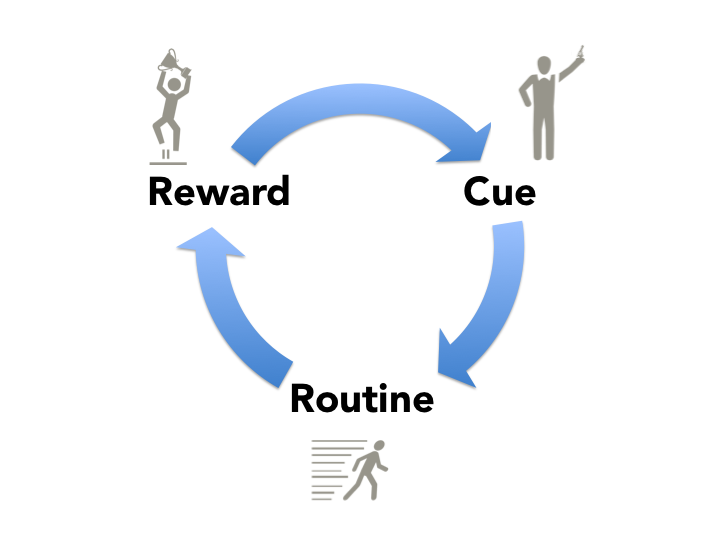 In the last posting, I presented the neurological framework of habits, described the auto behavior progression of cues—routines—rewards, and shared a case example loosely based on a coaching client (Sam) – a pharmaceutical R&D executive recruited from academia. Sam’s habits from academia were not aligned with the culture of his new employer, and therefore not rewarded. In this posting, I will describe my experience in working with leaders on habits that interfere with their growth and success. The goal is to disrupt the dysfunctional habits, and replace them with new leadership behaviors that help them succeed at work and in life. Theoretically, the dysfunctional habit can be disrupted by leveraging any of the three elements of the habit formation—the cue, the routine, or the reward. For example, if a leader continually disrupts the flow of a leadership team meeting by responding to text messages, one can eliminate the cue—take away his smart phone so that he cannot see the incoming text messages. Or, we might change the routine that he defaults to—tell him not to respond to incoming texts. Finally, we can change the reward/recognition mechanism to discourage him from answering incoming texts—have the team exhibit the right behaviors and call out his behavior to remind him that he is not adhering to the team’s norms. Experience shows that more permanent behavioral change occurs when the leader chooses and takes accountability for the new behavior. That is to say that the change is self-generated rather than imposed from an external source. In most cases, changes that are imposed from an external source have limited shelf life. They are effective as long as the external source can regularly inspect and monitor compliance, and can execute the consequences for non compliance. In our example, the cue (incoming texts) and the reward mechanism (public admonishment for texting) are both external factors that surround the behavior of the leader. However, ultimately, it is the performance of the routine itself that is displayed and judged. If the actor/leader’s auto response mechanism can be slowed down to the point where the leader is able to reflect and use judgment prior to acting, the habitual cycle can be disrupted. In the last posting, I described the case of Sam, the pharmaceutical executive whose habits and routines from his days in academia were not productive in the new setting. Initially, our work focused on making Sam more aware of the perceptions of his colleagues, and the differences between the academic culture (where he had spend the first 20 years of his career) and the culture of his new employer. Once he became aware of the adverse consequences of his habits, he agreed to practice new routines that were more aligned with his new culture. For example, he spent more time networking and asking questions prior to making decisions. In doing so, he gained a better understanding of the organizational dynamics and practices, such as ways to make requests for and secure additional resources. With this new understanding, our work focused on systematically changing his routines and habits in ways that were aligned to his new surroundings. Rather than unilaterally determining to pursue projects that he was passionate about, he spent time understanding the prioritization process that his employer used to determine which projects should go forward with additional clinical trials. With this new understanding, he became more adept at focusing his team’s efforts on areas of high priority for the organization. In addition, he coached the team to develop their ideas in a language and format that had maximum impact at portfolio review meetings. Naturally, it was not an easy task for Sam to break old habits. In fact, it took a great deal of perseverance and self-monitoring to change old habits. At first, the new ways of doing things felt unnatural and accompanied resentment for having to change practices that he had become so accustomed to. The new behaviors felt uncomfortable, and did not feel authentic and natural for Sam. However, with repeated practice and patience, he gradually became more comfortable with the new habits, and in some cases, he somewhat reluctantly admitted that they were more effective than his old habits. What has been your experience in breaking old habits? Were you able to break these habits permanently, or did you go back to them at some point? Why? How did you change your habit(s)? What has been the outcome of adopting your new habits?